Short's Goldenrod, Solidago shortii, is now blooming in my garden. Many people looking at it might say "so what", perhaps stifle a yawn and wonder why this is such a big deal. One bloom spike. Goldenrod. Kind of a weed to some. "That's nice", they might say and then want to move along with a "what else have you got?" Well how about I have blooming in my garden one of the rarest plants in the world? Every plant geek would be all over that. "Where, where? Lemme see!" Well, look again at Short's Goldenrod and you are seeing one of the rarest plants in the world. 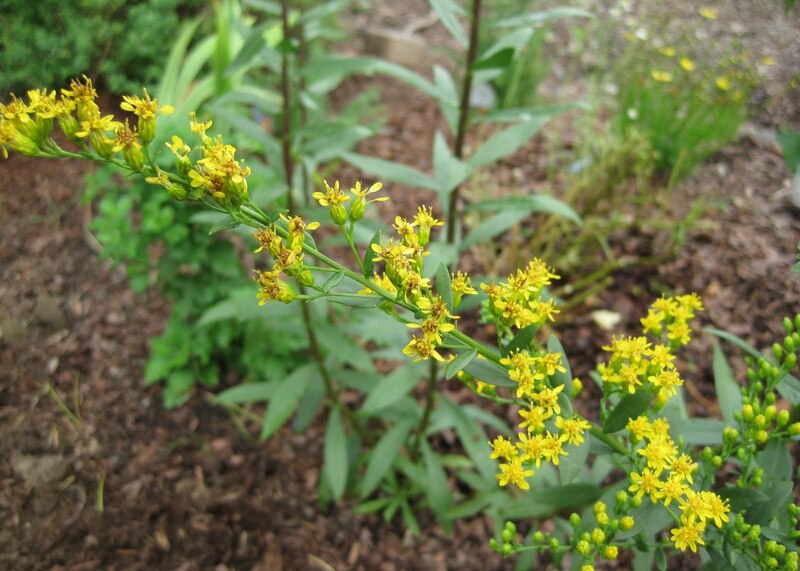 Thanks to the generous horticulturists at the Cincinnati Zoo & Botanical Garden, Brian Jorg and Steve Foltz, attendees of the Garden Writers Association Region III meeting earlier this spring each got a couple of seedlings of this rare goldenrod to take home to our own gardens. If you would like to know more about S. shortii, the Center for Plant Conservation has a plant profile for it on the web and the Nature Conservancy has a nice write up about it, too. You can also see pictures of a large stand of it growing at the Cincinnati Zoo on Foltz's website, PlantPlaces.com. Or stop by May Dreams Garden and see it. One of the rarest plants in the world. Now blooming in my garden. That's a cute one. I like how the flowers look like tiny daisies. It's very nice for a goldenrod. I'll let you grow it for a while and see if it decides to be a thug before I beg you for a start! I like it very much. Is it normal for it to start blooming now? Most of the goldenrod I've seen blooms in fall, but the goldenrod I ordered this year, Solidago sphacelata ‘Golden Fleece’ (a dwarf), is blooming a little bit right now. Oh! Saw your article in Horticulture - congrats! Mine is budded up, but not blooming yet. It will be interesting to see how it works compared to other garden worthy goldenrod, like 'Fireworks' or 'Golden Fleece.' Wonder if it will get powdery mildew like a lot of species do. With Solidago shortii, though, it is nice to know we're growing for the future. What a sweetie! I have several kinds of goldenrod, some of which are blooming now, and others will later in the summer. I hope yours continues to do well there. Wow! I love stories like this. Our local Mercer Arboretum here in Houston now has a section devoted to rare native plants and information about each one. Some are very tricky to grow, due especially their exacting soil requirements. 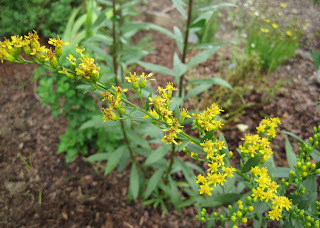 How interesting of a story on this goldenrod!! I take goldenrod as a supplement when I am feeling under the weather but this must be a different plant then yours. I love goldenrod - even the common as muck stuff. Would love to get my hands on this one. These are actually very common in Florida, and very pretty! Butterfly magnets! Congrats!! What a cool story! Let us know how it adapts to your garden. Thank you for sharing this information. What an amazing plant, I looked it up and now wish I had a stand...what will you do with the seeds? I'd be happy to try it in Austin! That's a pretty one, Carol, plus points for being rare and early blooming! What a cutie.Rare too. A double pleasure. Now this was a fascinating post, so informative. And a hearty congratulations and thanks to you and people like you who are helping propagate and preserve this rare plant. Plants are rarely "cute and fuzzy" and their babies don't roll around with big eyes, so they often lack proponents and spokespeople to promote their lives. I wonder how many plants have been lost, disappeared into development and rain forest destruction, never to be seen, and never even to be known to have existed. I certainly am interested in having this plant at The Havens; the new development I am planning in the front sounds like it would be the perfect environment for this goldenrod. I do like goldenrod, too. I have several varieties, and the fact that it is such an important pollen source for the bees in the fall makes it intrinsically valuable. Plus I just love the way it looks splashed against the red sumac foliage with the purple asters in the fall. Just so beautiful. Will this count as Plant Geek credentials? Not not only did Dr Short get the species named after him... he even had a whole genus named in his honor. Were there envious sighs all over the Gardenblogosphere? hmmm, I can't tell if you're making this up! :) shortii? ?